It’s time to solve our quasar mystery today. If you’ve been following my posts you know that early observed quasars were both visually bright and “loud” in the radio spectrum. 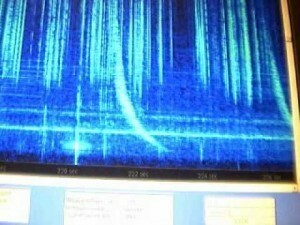 Later, “quiet” radio quasars were also observed. This was interesting because it meant there wasn’t a simple energy source just producing energy randomly, otherwise brightness and radio loudness should go hand in hand. Then in another post I wrote about how the brightness of quasars can vary a bit over time, and how that tells us something about the size of these things. What we found was that although quasars are as bright as an entire galaxy, the source of their energy is a volume only a few light years across, which is tiny given its intensity. That means we can rule out things like supernovae and nuclear fusion as an energy source. We’re now ready for our third clue. 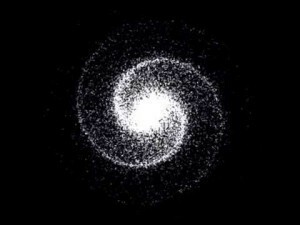 This comes from the observation that there are other bright objects out in the universe. One of these objects is known as a radio galaxy. These are radio loud galaxies that aren’t abnormally bright in the visual spectrum. Quasars are visually bright, and sometimes radio loud, sometimes radio quiet. Then there are other objects such as blazars, which are very, very bright in a wide range of spectra. While these objects initially appear quite different, they all stem from galaxies, and they all have an energy source with a small (on the galactic scale) volume. Of course we do know of one very powerful energy source with a small volume: black holes. As I’ve written earlier, we have a great deal of evidence that a supermassive black hole exists in the center of our galaxy, and in most other galaxies. So it seems reasonable that a black hole could be the source of these very bright energy sources. But how could we prove this to be the case? The key is recognizing that quasars, radio galaxies and blazars are all related. 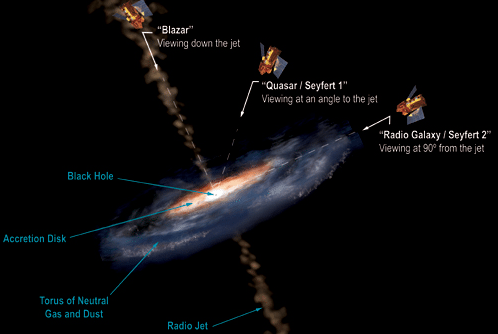 When a supermassive black hole eats nearby gas, dust and stars, it is known as an active galactic nucleus (AGN). These active black holes have superheated material swirling around them in a circular disk, known as an accretion disk. They also have jets of gas and dust shooting out from their polar regions at a large fraction of the speed of light. The jets are formed by a fairly complex process, but basically some of the material from the accretion disk gets so much energy from the heat, magnetic fields, and such that instead of falling into the black hole it shoots away and escapes. You can see a basic model of all this in the figure below. The material in the accretion disk is swirling around the black hole in a tight circle, which means all the charged particles in the disk are being accelerated. When you accelerate charges, they give off radio waves along their direction of motion, known as synchrotron radiation. So if you were to look at an AGN along the edge of its accretion disk, you wouldn’t see much of the disk in the visible spectrum, but you would see a great deal of intense radio energy. In other words you would see a radio galaxy. If you look at an AGN from a bit of an angle, you would see intense visible light from the superheated accretion disk, and depending on your angle you might (or might not) also see intense radio waves, which makes it a quasar. Finally if you viewed an AGN down the barrel of a jet, you would see the very intense energy source of a blazar. So now we know that quasars are active black holes in the centers of galaxies. 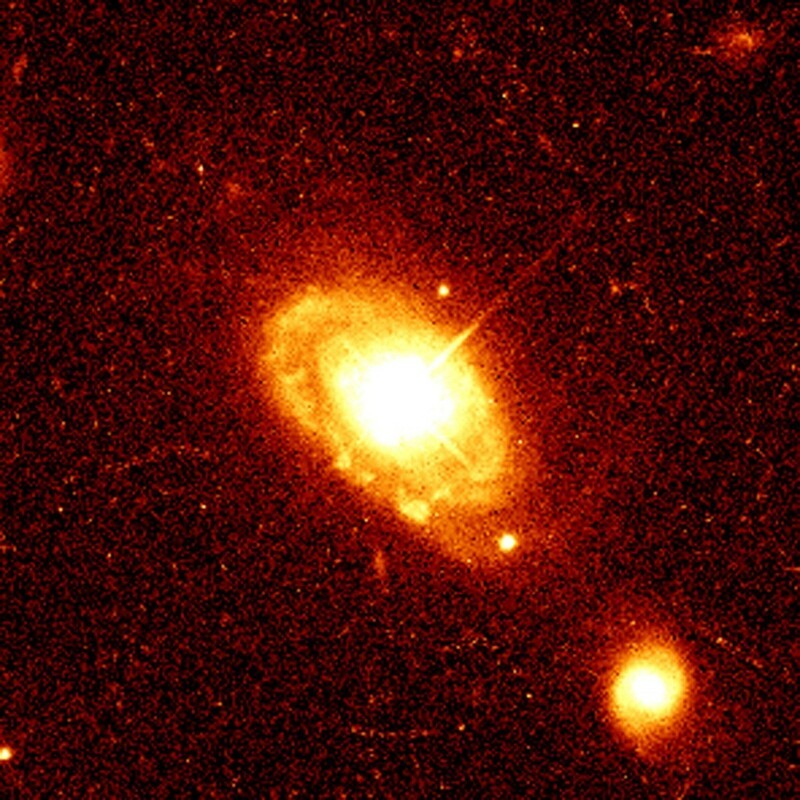 Since we see quasars at very high redshifts, we know that galactic black holes existed even in the earliest galaxies. We also know that quasars are part of a diverse family of active black holes.